Adelaide Oval is one of Australia’s most picturesque test cricket grounds, situated in parklands with the backdrop of St.Peter’s Cathedral. The ground has a lot of charm to go with its significant history, dating back to 1871. 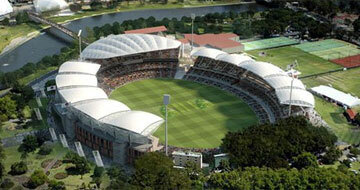 Adelaide Oval now has three main grandstands: the 2-tiered Bradman Stand at the Southern end, a one level stand, which stretches the whole Western wing, and the new Chappell Stands on the Eastern side of the ground which were constructed in 2003. The rest of the ground comprises of a grass hill which includes several rows of seating near the boundary fence.